"a smooth(er) action vibrato which returns exactly to pitch every time and doesn't sacrifice an ounce of tone"
Unique and instantly identifiable, Gus guitars make a belting first impression. What will Jordan McLachlan find as he delves deep below the surface? 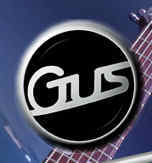 Few guitars assault the visual senses as boisterously as Gus’s curvy, chromed-up offerings. And of the range the G3 bass arguably makes the biggest impression. Its squat, offset body shape, funky little horns and big old fingerboard inlays make it one of the most distinctive instruments ever. With bass players typically a more open-mined breed than their six-string counterparts, it’s no surprise that the G3 has been so well-received since its inception in 1996. Granted, it’s not a bass for the shy and retiring or the truculently traditional, but for those with a penchant for personality and peculiarity it’s an exciting proposition. So let’s see if this one’s two-tone finish is backed up with top tone. In common with all Gus guitars, this G3 five-string active model is based around a moulded carbon-fibre and cedar composite body and neck. The whole of this structure is formed as a single piece, from the tip of the headstock to the bottom edge of the body, with the two chromed horns bolted on and a very nicely grained cocobolo fingerboard fitted to the neck. The body section is curved from top to bottom (viewed from a playing position) and the moulded nature of the construction means that it’s all exceptionally graceful, contoured beautifully from the body into the neck and ‘cutaways’. There’s a lovely, liquid aesthetic to the rear of the body. Around here you’ll also find the angled jack output socket, a neat Gus touch, and plates for accessing the active circuitry, 9-volt battery and the back of the company’s own-design bridge. Although it looks frightfully hi-tech, there’s nothing outlandish about the way the G3’s neck feels. In fact, it presents itself as most friendly, slightly flattened-out, modern five-string necks should- it’s reasonably shallow front-to-back but certainly substantial, and while old P-bass fans might find it a disorienting experience, the rest of us will have few problems in getting to grips with it. Factor in a sensible 45mm nut width, a low-but-no-buzzes action and perfectly installed medium frets and Gus, and us, are onto a winner. It’s rare to start this section by blathering on about machineheads, but we’ll make an exception here. The Gotoh 510 ’heads fitted to this G3 (Hipshot Ultralites are an option) are absolutely gorgeous and are ideal for the overall design smooth but positive in action and with that lovely ‘sucked sweet’ look about them, nothing could be better. But it’s the cleverness at the other end that’s the really important stuff. As with all Gus instruments the G3 features lipstick-style pickups- no coarse black open-coiled Motherbuckers or anything here- and this pair are linked to a stacked master volume control/mid EQ (the control nearest the neck), a four-position pickup selector switch and a stacked bass/treble EQ control. The use of stacked designs keeps the front of the bass relatively uncluttered and the chunky pots themselves look and work just as they should, with centre-indents for all tone controls. The only other piece of hardware to concern ourselves with is the unique Gus bridge, a funky, yet simple design which is used for all the non-trem guitars and basses. Adjustable for string height and intonation, the movable parts of the aluminium bridge lock tight once tweaking is complete to ensure an exceptionally solid anchor. This arrangement also ensures good transfer of string vibration to the body, making the most of the G3’s already impressive sustain and balance. For what is such an apparently straightforward, uncomplicated pickup/control system, the G3 delivers a wide range of tonal choices, from trebly rear pickup clank to warm, cotton-wool thickness. Part of this sound spectrum can be attributed to the active bass and treble controls, which in themselves offer a significant tone-shaping facility. However, the four-way rotary selector is the bass’s secret weapon. The two outermost settings deliver the two single-coil tubes on their own, with the two inner positions switching both pickups in together in series and parallel, giving rise to thicker humbucking tones. It’s a system that feels completely familiar after just a few minutes of fooling around, and one that’s capable of creating some gorgeous (and some rather spiky and aggressive) bass tones. The really clever thing about the electronics is the way in which you can approximate all the ‘standard’ J and P-type sounds quickly and easily, but also access a whole world of fatter and chunkier, or biting and more wiry tones. With both pickups coupled in series you arrive at a sumptuous, fat warmth that can be as clear or as dubby as you like. At the other end of the scale the rear pickup on its own, with just a tad of extra mid-range and treble, a healthy dose of compression and a dash of overdrive makes for wicked, dark electro-rock lines. The curvaceous body design makes the G3 a tactile experience, although it’s probably fair to say that those of us used to more trad-style instruments will take a little while to fully appreciate its appeal. But it soon feels nicely familiar and the easy-playing neck helps no end in this respect. There’s a very slight tendency towards neck-heaviness (this being a five-string and all), but a decent wide strap arrests any potential headstock dives. Gloriously shimmery finishes are something of a Gus trademark and this G3 bass is treated to a fabulous colour-changing purple/dark green chameleon mix called ‘plum crazy’ that adds yet another brownie point to the guitar’s scoresheet. It looks stunning in the flesh and will really come alive under stage lights. Want to get noticed? Then look no further! world-class bass. A lesson in brave, modern guitar design then? We think so. Copyright Guitar Buyer Magazine ©2003. Used by kind permission of Guitar Buyer Magazine.